This simple and delicious recipe has been inspired by the cuisine of southern-Asian. It works particularly well with our Brown Rice with Turmeric or rice noodles. 1. Mix all ingredients and marinade the shrimp for 30-60 minutes. 3. 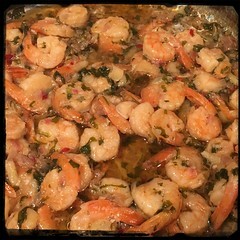 On medium heat, using 1 tbsp coconut oil, cook the shrimp for about 5-10 minutes.